Fresh curry leaves are washed and dried under direct sunlight. They are then ground into powder. Store the dried curry leaves powder in a tight jar and use as required. 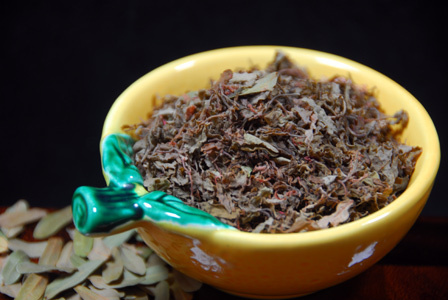 Makes: around 1/8 Cup Dried Curry Leaves Powder. Separate curry leaves and thoroughly wash them. Pat them dry and spread on a cloth or a wide plate. Let the curry leaves dry under direct sun light for a day or two or until the curry leaves are crisp. 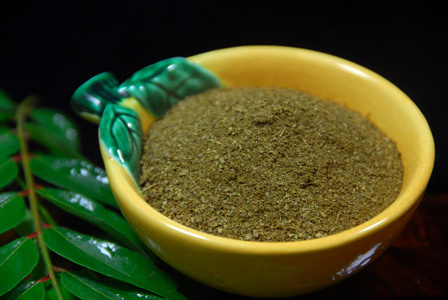 Grind the dried curry leaves into fine powder. Store the dried curry leaves powder in a tight jar. Notes: Make sure to cover the curry leaves with a net cloth to avoid them from flying. Suggestions: Use dried curry leaves powder as a substitute for fresh curry leaves in curries and fries. Variations: You can also crisp the curry leaves in oven on low heat setting. You can use the curry leaves powder for the curry leaves rice recipe. Other Names: Enda Pettina Karivepaku Podi, Dried Curry Leaves Powder. 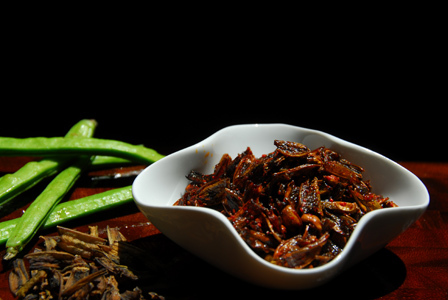 Makes: around a Cup of Dried Tamarind Leaves. Wash tamarind leaves thoroughly and pat them dry. Spread the cleaned tamarind leaves on baking tray. Preheat the oven to 180 F – 200 F.
Place the tamarind leaves tray for 1 hr 20 min to 2 hr. Check in the last 15 – 30 min to make sure all the leaves are dry and crisp. Alternatively, leave the tamarind leaves in direct sun light until dry and crisp. Rub the crisp tamarind leaves between the palms to powder them if necessary. Tightly store the dried tamarind leaves in clean dry jar. Notes: Make sure to discard any big or fat stems before storing the tamarind leaves. Suggestions: Make sure tamarind leaves are thoroughly dry before placing in the oven. Variations: Check other dried Stuff here. 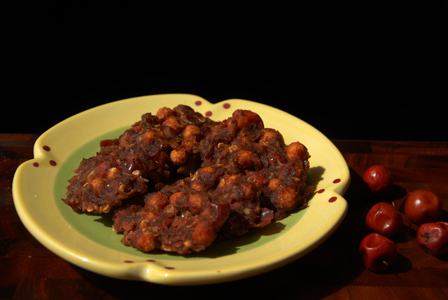 Other Names: Endapettina Chinta Chiguru, Dried Tamarind Leaves. Bring to boil 3 cups of water, add chopped cluster beans, turmeric powder and salt. Once cluster beans soften a bit, strain the cooked beans. Spread the beans in a flat plate and keep it under sun for 3 – 4 days. Once beans are completely dried, store tight in a jar. When necessary, fry the dried beans and sprinkle red chile powder and salt. Serve fried beans with steamed rice and ghee. Notes: Make sure beans are completely dried before storing. Wash and roughly chop tomato. Heat oil in a deep pot, add dried pindi vadiyalu and fry them until golden brown. In the same pot, add all talimpu ingredients in order. When mustard seeds start spluttering, add green chiles and onion. When onion starts to brown, add tomato, red chile powder, turmeric powder, coriander powder, cumin powder and salt. Fry for few seconds and add around a cup of water. Once water comes to a bubble, add fried vadiyalu and cook for about 2 – 4 minutes on low flame. 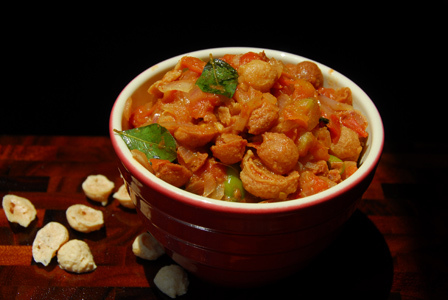 Serve with steamed rice and ghee. Notes: Make sure not to overcook vadiyalu. Clean, remove stems, wash and pat dry bher. Using a mortar and pestle, first pound green chiles and jaggery. Then add cumin seeds, bher and pound lightly to let the juices of bher come out. Take spoonfuls of the prepared bher mixture and arrange on a flat plate. Keep it under direct sun until the bher is completely dried. Store tight in a clean dry jar and serve when necessary. Notes: Make sure not to crush the seed inside bher.